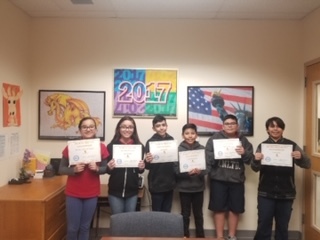 SOMERTON, Ariz., February 25, 2019 – ​​Somerton School District, on the Mexican border in Arizona, with a low-income student body, has made tremendous strides in academic achievement with the help of the STEM Academy program of the National Education Foundation (NEF). According to Dr. Laura Noel, Superintendent, the goal is to be the highest achieving district in Arizona. Recent data shows Somerton is well on its way to meeting this impressive goal. With 3,000 students distributed across five schools, Somerton is exceeding expectations through a focus on efficiency, by using the STEM Academy program of the NEF, the national non-profit leader in STEM education. NEF has provided an 80% matching grant for the implementation of its Total STEM System Solution (TSSS), the most cost-effective STEM system solution in the U.S.
TSSS consists of four modules – 1) Academic individualized learning mapped to state standards, with 2) incentives for students, teachers and parents, that advances a student one grade level in a subject like math in 25-35 learning hours, 3) Hands-on Robotics, a STEM design contest by NEF’s academy partner SUNY (State University of New York), and 4) STEM career prep programs in CyberSecurity, AI, Project Management and 9 other high-demand job areas. The Somerton program is part of two national NEF STEM initiatives recently announced by Dr. Appu Kuttan, Chairman of NEF, namely, the STEM Vision for America to prepare one million students for college and the STEM workforce, and STEM Vision for American Teachers to prepare one million teachers in using technology and business skills better and more effectively in the classroom. NEF provides 80% to 95% grant for both programs. Parents also benefited from using SuccessMaker at home with their children. Perhaps the biggest advance in differentiated education came from NEF’s proven incentive program for students, teachers, and parents. Teachers have found the summer STEM program, specifically the Robotics provided by NEF, rewarding on multiple levels. This year Somerton had two teams bring back trophies from local and state STEM contests. Previous articleDave Shoup’s New Book “UFOs: First Person: A Lifetime of UFO Secrecy” Details Intricate Circumstances With UFO Conspiracies to the Populace.